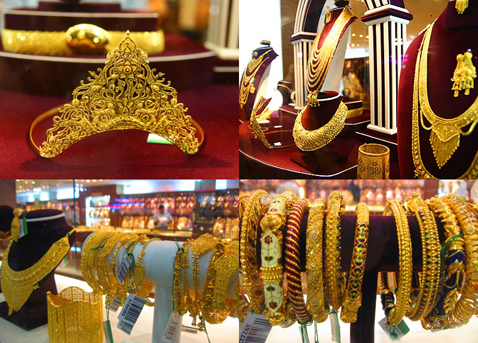 India and Gold jewelry is something inseparable from each other. Indians considers gold to be a sacred element. It has much religious significance linked to it. Thus gold jewelries in India have a special place in the hearts of the people. Jewelry brands are a very new concept in India because earlier Indian were used to buying gold from their local family jewelers. Gold is required for every auspicious occasion in this nation, be it in weddings or festive seasons like Diwali etc. During this time the jewelry brands are seen to be in very good shape and doing good business. Since Diwali is on the doorstep, let us take a look at the top 5 gold jewelry brands in India you can go to this season. Tanishq belongs to the Tata group thus gaining an obvious edge over the other brands. Even though Tanishq is relatively new it has been able to introduce the concept of jewelry as a ‘brand’ in India, hogging the obvious benefits thereafter. The gold jewelry designs of Tanishq are seen to be the inclusion of all the different specialties of the different states in India. Their USP is the ‘purity’ of gold they sell. P. C. Chandra Jewellers are from east India with its base in Kolkata specializing in Bengali gold jewelry designs. The designs they come up with are highly culture specific and appeal to traditions. This gives regional brands like P. C. Chandra a chance to make it big in the market. The Goldlite collection launched by P. C. Chandra has been gaining immense popularity especially with the rising prices of gold. D’damas is a joint venture of the indigenous Gitanjali Jewellers and the UAE bases Damas group. It is a known name in the market for its unconventional gold jewelry designs. This brand taught Indians to step out of tradition and adopt a new contemporary way of wearing gold. They have an awesome range of Italian designs with Lara Dutta as the brand ambassador. The concept of wearing gold differently started appealing to the young Indian woman after her hit ad. Thribhuvandas Bhimji Zaveri was a household jeweler who could turn into a nation wide jewelry chain. It has been in business for more than about 150 years and today is considered as one of the top jewelry brands in India with their base in Mumbai. Their designs are decidedly elaborate and considered as the store house of the best wedding collections in town. Jos Alukkas is another top jewelry brands for the south. It is based in Thrissur, Kerala with stores all across the 4 southern states. They have been dwelling in culture and tradition and thus being able to appeal to the hearts of the Indian. They are doing very well in the market, especially in the wedding jewelry section. So if you are planning to buy gold this festive season then keeps these five names at the top of your list.